The Sydney rock oyster, C. commercialis, and the Auckland rock oyster, C. glomerata, are cultivated on stakes or sticks in Australia and New Zealand respectively. In almost all commercial oyster grow-out systems, the main techniques consist of planting spat in protected areas with suitable temperature conditions and high primary production, grading and replanting when needed, providing protection from predators and pests and fattening for the market. The different systems described are mainly designed to facilitate the use of available sites and to enable better utilization of primary productivity for the nourishment of the oysters. The Sydney rock oyster, C. commercialis, and the Auckland rock oyster, C. glomerata, are cultivated on stakes or sticks in Australia and New Zealand respectively. 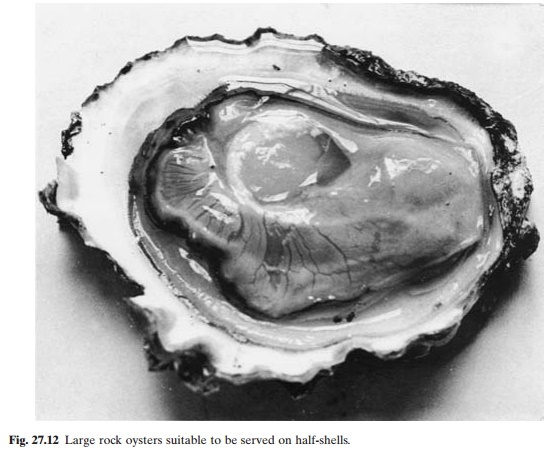 Like all other oysters, spat of rock oysters are available for collection in areas with low current velocities, which are not the best areas for growing them. Areas with a better tidal flow at levels slightly below extreme low-water neaps are selected for on-growing on racks of the same design as used for spat collection. The sticks containing the spat from the collection grounds are transferred to the growing area when the spat are about 10 months old. The sticks are arranged parallel to the racks in several layers close together, to protect the spat from predators and from the hot sun at low tides. By the time the oysters are about 18 months old, the sticks are unfastened and rearranged across the rack, leaving more space between them for better circulation of water and food organisms. They are left to grow there until the third year, when they are about 29–30 months old. At that time, if the sticks are fully covered with oysters, it may be necessary to give them more space for growing. A further rearrangement of the sticks is done leavingspaces between 15–16 cm. Three-to-four-year-old oysters are harvested and graded according to size. Large oysters (plate oysters) weighing about 70 kg per 1000 are sold to be served on half-shell (fig. 27.12), and the smaller ones (bottle oysters), weighing about 40 kg per 1000, are shucked and packed in bottles with water, for use in oyster soups, stews, etc. The Auckland rock oysters, grown on sticks, are ready for harvest when about three years old or even less in especially favourable conditions. An alternative practice is to grow the oysters for about 33 months on sticks and then mature or fatten them on trays. Tray farms are built in sheltered areas, where racks are built to support the trays at the optimum growing height. An improvised breakwater is sometimes necessary on one side of the farm for extra protection. The dreaded oyster predator in Australian rock oyster farms is the porcupine fish (Dicotylichthys sp.). Others, like the sting ray, toad fish (Sphaeroides sp. ), etc., are also major predators. The oyster borer (Lepsiella) and the mud worm (Polydora) are common enemies. The rack culture system and the practice of arranging the sticks close together when the oysters are young limit exposure to predators to a great extent. Rock oyster farming in Australia and New Zealand suffers considerably from the so-called ‘opening disease’ or ‘winter mortality’ of adult oysters, which actually occurs in early spring. The cause of the disease is not definitely known, but it is suspected that it may be caused by the Haplosporidian Minchinia, which also affects the American oysters. Oysters show a characteristic ulceration in the body. Farmers in New Zealand are advised to raise cultivation to mean high-water level or move the oysters well upstream, if possible. A number of tropical species of oysters associated with mangroves have been cultured on an experimental or small scale. The mangrove roots form excellent substrates for spat setting. In the mangrove environment, the oysters grow best at lower mud levels, with longer periods of immersion. So most attempts to culture these oysters have been based on the principles of collecting spat on stakes or shell-strings and off-bottom growing with the spat suspended from submerged racks or rafts. 10 kg per 1000 (Nikolic et al., 1976). Seed of C. tulipa grown on rafts in Sierra Leone arereported to have grown to lengths of up to 10 cm in seven to eight months (Kamara and McNeil, 1975). C. brasiliana grows less rapidly, and in the subtropical climate of Southern Brazil it takes 18 months to grow to 6cm and 30 months to grow to 8 cm (Wakamatsu, 1973). The mangrove oyster C. belcherii, when cultured by a combination technique of seed collection on asbestos strips held in trays and grow-out in trays suspended from rafts in Sabah (Malaysia), were found to grow to a weight of 14–21 kg per 1000 in one year (Chin and Lim, 1975).